The Toronto Star was quick to post this story. Here is the Porter press release. Canada’s Porter Airlines was the unidentified “Americas” customer announced some months ago to have signed a Letter of Intent for 12+18 CSeries. The companies revealed today that the customer is Porter Airlines, which chose the CS100 for operations at the highly restricted and difficult Toronto City Airport. 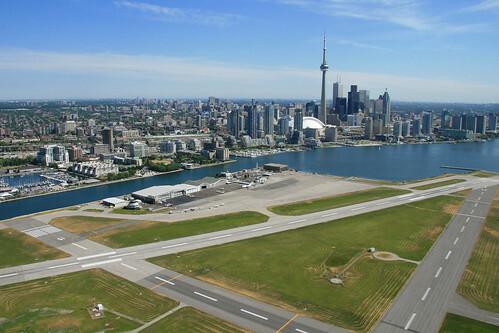 The airport is on a small island near downtown Toronto and currently is restricted to turbo-prop service. Porter operates Bombardier’s Q400. The runways are short; the longest, 8/26, is a mere 3,988 ft. Porter is asking authorities to extend the runway. There are also noise restrictions, but Bombardier, Porter and Pratt & Whitney say the CSeries Geared Turbo Fan engine, combined with the airframe, won’t be a noise nuisance. This is another win for the CSeries at noise-sensitive and difficult airports. Swedish airline Malmo ordered the CSeries for one of its difficult airports. An unidentified customer, believed to be but never confirmed as PrivatAir, was widely reported to have ordered the airplane for service to London City Airport, another short-field, noise-sensitive airport that also requires a steep glide slope due to surrounding buildings. Here’s a story from The Province posted this morning in advance of Porter’s announcement. According to wiki, Porter has yet to make a profit since it began operations in 2006. The Chairman of the Board of Porter is Donald Carty, a former AA/AMR CEO (about 1999 to 2003). The CS-100 has a list price of about $62M USD, and BBD is not known for giving big discounts as Boeing and Airbus are. So, I just don’t see how Porter can afford to finance these new airplanes. Porter already has a fleet of 26 Q-400/Q-400NG airplanes with 70 seats each, they have 4 more Q-400NGs on firm orders. All of their airplanes are new builds beginning in 2006. I think we have been down this road before with new start up airlines. Feel an urge to rain on Bombardier’s parade? Max is (I believe) also Stage 4 minus 15. Figures for the month show 125 million Available Seat Miles (ASMs) and 74.2 million Revenue Passenger Miles (RPMs). ASMs grew 5.5 per cent from 118.5 million and RPMs decreased 7.5 per cent from 80.2 million last year. I would expect a GTF powered NEO to be less noisy then a LEAP powered NEO, due to the slower running, bigger fan of the GTF. Would expect a GTF NEO to be almost the same as the C series, and 5dBA is huge. The early C series test flight will be very interesting to a number of parties. Would be interesting to see how Bombardier is claiming a 5 dB noise reduction over the MAX and the NEO. That would be a stretch, quite honestly. We will see whether the airframe and engine combination can really muster that. Also, that is a tiny runway! Makes me wonder what sort of landing flap / speed and thrust reverser technology they have. I know Boeing made the NG with a small-runway configuration because Airbus was marketing that they could land at small airports in Brazil. Smaller, lighter airplane, modern design, not something from the 1980s in the case of neo or the 1960s in the case of the 737. BA A318 range at LCY is limited to 800 nm. The CS100 range with 4000 ft runway is about 1500 nm. Noise limits depend on aircraft weight (MTOW) (ICAO Annex 16). An aircraft 20 t heavier than another aircraft may be1,5 dB louder. So the lighter CS100 already has to be more quite. Today 10 dB below the limits is a common value for all modern jet engines in use today. 5 to 10 dB reduction due to the lower speed of the fan and the higher bypass ratio is believable. All values mentioned above are rough estimations. Airbus may gives a more conservative prediction with 15 dB less (calculated 17 dB) and for Bombardier 18 dB are about 20 dB less. I have no doubt CS100 will be far more quite than NEO or MAX. They want to extend the runway 168 m (almost 184) yards at each end. That would mean landfill at both ends. The west end extension would partially block a channel accessing the Coronation Park Marina. Look for heavy resistance from the local population. The wikipedia article mentions the friction with local citizens. The order is conditional. I guess we now know what the conditions are. It would be cool if they pull it off but I do believe they have a big battle ahead of them. I looked at the satelite photo of the airport on Google maps. The water off the end of the west end of the runway is very shallow and a 168m extension would not require much landfill and would not impede navigation. The east end looks very deep but is doable and would not impede navigation either. Porter says they are the launch customer so they have to resolve this issue in the next two years. That sound tight considering the layers of approval required especially if there has to be an enviromental impact assessment. If there’s a shipping channel off the end of the runway, then passing ships become potential obstructions. I think the rule is that for a continued takeoff after an engine failure at V1, the aircraft must clear obstructions by at least 35 feet. Gee, wouldn’t it be exciting to be on the bridge deck of your cabin cruiser when an aircraft goes over 35 feet above your head? Not a problem. The channel entrance will still be over 500m wide and not part of a main shipping lane. Used mainly by small craft going to the marina. Google ‘planes landing at St Maarten Island’ to see the clearnce there. I agree with Frank, it should be no problem. Short final to BOS Rwy 4R takes you right across the ship channel to one of the busiest ports on the East Coast, Boston Harbor. In fact the approach lights for 4R extend well into the harbor. Across the harbor entrance is the Conley Container Pier where container ships on load and off load shipping containers, and close by is one of Boston’s Cruise Ship Piers, at the old Boston Navy Shipyard where the USS Constitution is dry docked when she needs some of her copper or wood replaced below the waterline. The only restriction I can remember (and I don’t know if it is still in place or not) was Rwys 4R and 4L could not be used with a LNG/CNG tanker ship was passing through the ship channel in this area. It is not uncommon for a ship that is 150′-200′ tall above the waterline to pass by these runways, even at high tide (Boston tides are some 15′-18′ between high tide and low tide). Isn’t LGA also near a ship channel? The spectacular St Maarten video clips are for landings. I suspect the aircraft are allowed to approach as low as they do because the the area off that end of the runway is recognized as a clearway. I’m not familiar with the Conley container pier, but if the cranes are under the takeoff flight path they will count as fixed obstructions that departing aircraft must be able to clear after losing an engine on the runway at V1. As for ships, passing through a channel near a runway end, takeoffs may be restricted as you say until the ship has passed. There are several rail mounted cranes at the Conley Pier. I have no idea how tall they are but you can see them clearly on google Earth.